How a Slate scientist changed the NBA forever. How a Slate scientist changed the NBA forever—or at least a week. If you’re a scientist, you don’t get many opportunities to work in professional basketball. I don’t have any illusions about my chances of becoming a player, a head coach, or the Phoenix gorilla. But I have held out a tiny bit of hope that some day I’d be able to use my grad-school education to help some woebegone franchise shut down opposing free-throw shooters. Last week, my dream came true. In today’s NBA, there’s no subtlety to free-throw defense. Hometown crowds try to unnerve enemy shooters with rally towels, pompoms, clackers, rhythmic chants, balloons, and signs that say “BRICK.” It doesn’t take a scientist to see how poorly this stuff works. In the 2003-2004 NBA season, free-throw percentages at home and on the road were identical to within one-twentieth of 1 percent. One hundred ninety-four players shot free throws better at home; 192 did better on the road. Undeterred by the facts, NBA teams hand out special distracting equipment to fans behind the backboards. Some get foam “wiggle sticks,” or “thunder sticks”—those long, skinny white balloons you wave in the air and smack together. Others get signs with particularly distracting words printed on them. These tools might be effective, but they don’t come with instructions. That’s where the staff neuroscientist comes in. Last week, I wrote to the NBA owner I deemed most likely to consider applying the scientific method to free-throw shooting, Mark Cuban of the Dallas Mavericks. I told Cuban that the assumption that waving balloons wildly will produce the biggest distraction is just plain wrong. Given how the brain perceives motion, randomly moving balloons aren’t very off-putting. When you see a lot of little objects moving crazily back and forth, all the different motion signals that get sent to the brain cancel each other out. In the mind of a free-throw shooter, a crowd of people waving wiggle sticks looks like a snowy TV screen. This sort of white noise might make it harder to see the rim, but the stats show that isn’t a big deal for the pros. But what if the waving balloons didn’t cancel each other out? If fans behind the backboard waved their balloons from side to side in unison, opposing players would perceive a field of background motion. When we see a moving background, we tend to assume that we’re the ones moving and that the background is staying put. If everything on my desk suddenly drifted to the right, I would probably assume that my chair had rolled to the left. And if I were at the free-throw line as the world drifted to the right, my shooting motion would automatically compensate for what I perceived to be my own motion to the left. David Whitney, a visual psychophysicist at the University of California-Davis, * recently described this phenomenon in the lab. The results, published in Nature (“The influence of visual motion on fast reaching movements to a stationary object“), showed that a field of background motion can bias hand movements in the direction of that motion. A few hours after I wrote Cuban that first e-mail, I got an answer. “I love using science to gain an advantage,” he wrote. He said he’d give the plan a try. But how do you go about getting a bunch of unruly, brawl-inciting NBA fans to flap their sticks in unison? I had suggested that a human conductor might do the trick. At schools like Duke University and the University of Texas, student cheerleaders lead similar organized distractions, where everyone waves their arms together in one direction. If Cuban could get someone in the stands to conduct the thunder sticks, the plan might work. The Mavericks sprang into action at their next opportunity. During last week’s game against the Celtics, three members of the Mavs’ “Hoop Troop” worked the crowd behind the backboard. Boston shot 18 for 30 from the line, or 60 percent, about 20 percent below their season average. The Mavericks kept up their suddenly stout free-throw defense in the next game, holding the Bucks to 17 for 27 from the charity stripe—63 percent. But in the game after, on Wednesday night, the Lakers were seemingly undeterred by Hoop Troop staffers waving big red arrows to direct the crowd’s stick movements: They shot 21 for 27, or 78 percent, pretty much the league average. In total, though, the project has been a success. Mavericks opponents have shot 8 percent below the league average since adopting my strategy. More important, Dallas has yet to lose a game. An 8 percent effect may not seem like a big deal, but even a tiny decrease in shooting percentages can change the course of a season. Last year, the Cleveland Cavaliers missed out on a playoff berth by just one game. I went through their home box scores and figured out that even a 3 percent decrease in their opponents’ free-throw shooting would have gotten the Cavs a chance at the playoffs. The league rules on the legality of the kind of coordinated behavior that I suggested are a bit ambiguous. While almost anything goes in college, from the tie-dyed T-shirts and giant swirlies displayed by Wake Forest students to the posters of near-naked women used elsewhere, all pro teams must follow a set of guidelines on “End Zone Distractions.” According to the NBA Operations Manual, fans may not wield anything designed to create optical illusions or that might affect a player’s ability to perceive depth—specific (and somewhat arbitrary) examples include pinwheels, umbrellas, and laser pointers. Balloons and wiggle sticks are explicitly permitted, so long as they’re deployed by fans and not team employees. There’s a special exception to this last rule for team mascots. If Cuban had the Mavs Man and his horse-friend Champ steer the crowd rather than three Mavericks employees, he’d almost certainly be in the clear. An idea that would surely test the rules comes from David Whitney, the scientist who published the visual-motion study in Nature. Whitney suggests that it would be easy to create an improved version of the thunder stick that becomes more noticeable when waved in one direction. One such device might work by hanging LEDs inside a hollow tube with holes in it. When swung to the right, the LEDs would be visible through the holes, creating spots of light that would vanish when the stick went back to the left. As hundreds of fans shook the sticks wildly, the shooter would see something that looked like a flurry of snow drifting in one direction. I’m sad to say that my success as a basketball scientist was short-lived. A mere three games into this bold new era, I got fired. 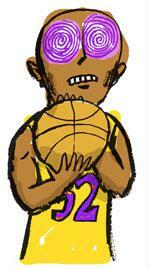 “It failed miserably last night,” Cuban e-mailed me the day after the Lakers game. “I think our early success was random.” I can’t help but wonder if the Mavericks are giving up too soon. Slate’s photographer told me that the Hoop Troop’s movements weren’t even timed to the shooting of the basketball. If I’d been the guy leading the crowd, we would have done things right. Correction, Jan. 12, 2005: This piece originally stated that Paul Whitney does research on visual perception at the University of California-Irvine. In fact, he is at the University of California-Davis. Return to the corrected sentence.